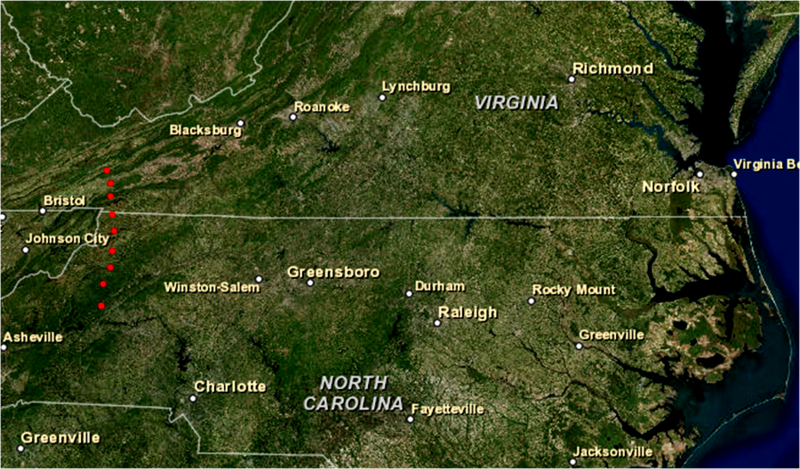 The Spanish were the first Europeans to explore and to establish a settlement in what today is Virginia. Despite occasional claims by boosters of tourism, the English settlements in Virginia (1607) and Massachusetts (1620) are over 80 years too late to be the first colony started by Europeans on the North American continent, and roughly 40 years too late to be called the first colony started by Europeans in Virginia. 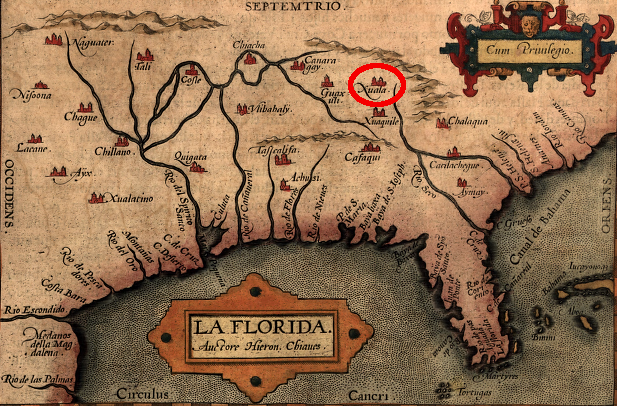 The Spanish considered Virginia to be part of Florida. The southeastern coast of North America was named by Ponce de León in 1513, when he came on land at during "Pascua florida" (the Feast of the Flowers). Since Virginia was originally the northern part of Florida, the first European name for Virginia was based on the Spanish term for Easter. Seven decades later, a rival group of Europeans gave the region the name Virginia to honor their Queen Elizabeth, the "virgin queen." Spanish explorers mapped the North American coastline north of Florida up to Newfoundland, Labrador, and Greenland by 1501. Ponce de Leon made the first major effort to establish a permanent settlement in North America in 1521. In the 1560's, Spanish officials sent a military expedition inland that explored southwestern Virginia, and in 1570 Jesuit priests tried to establish a settlement on the York River. 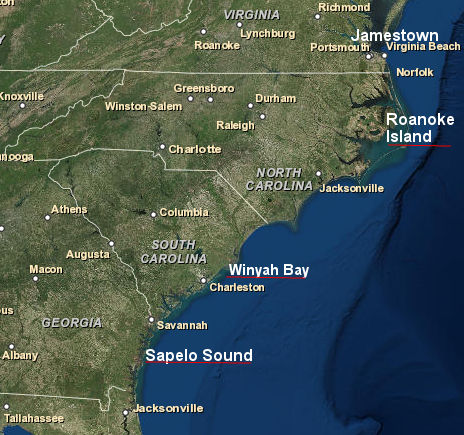 The English did not arrive at Roanoke Island for the first time until 1584. By the time investors in London started a settlement at Jamestown in 1607, the Spanish had been exploring, conquering, enslaving, converting, and settling at different places in the New World for over a century. 2) block French settlements in "La Florida"
European colonization of the North American continent began soon after Columbus's discoveries. 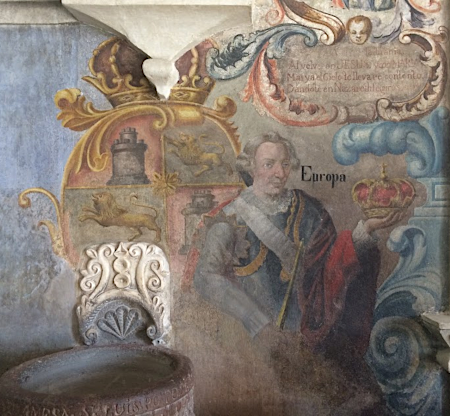 The Spanish started permanent colonies in the Caribbean, and Santo Domingo (founded 1496) remains the oldest continuously-occupied colonial settlement in the New World. The Spanish were not alone in trying to explore and settle the New World. There was competition from other European states, but initially they avoided the Caribbean because of the Spanish presence there. During the 1500's, English and French explorers looking for fishing grounds determined the outlines of the North American coast north of New England. The sailors constructed temporary camps on Newfoundland when fishing off the coast. Those camps remained as isolated, single-purpose communities, occupied only during the time when cod were being caught and dried for transport back to Europe. In 1541-3, the French tried to establish a permanent settlement on the St. Lawrence River. That failed, but the French returned in 1603 to start again at St. Croix Island and Nova Scotia. In the six decades between those efforts, the French sought twice to build colonies on the southeastern coast of North America. The settlement at Charlesfort (1562) collapsed before the Spanish had an opportunity to attack it. The Spanish destroyed the later French colony at Fort Caroline (1565), and then Spanish soldiers executed Jean Ribault and nearly all of of his shipwrecked colonists in a massacre on a Florida beach. 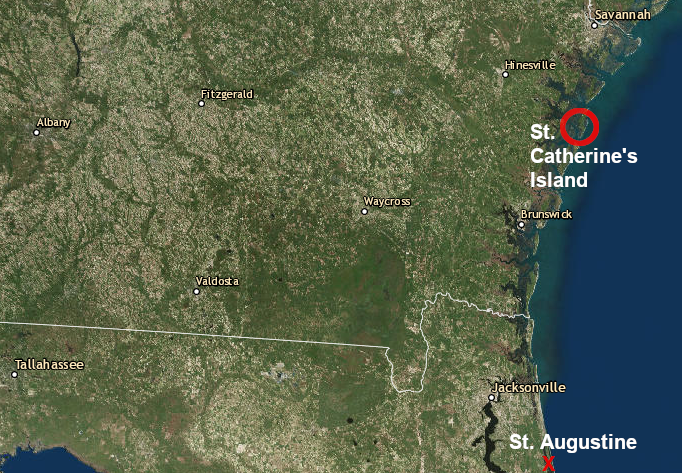 After that experience, France avoided conflict with Spain by settling much further north of St. Augustine. By choosing St. Croix and then Quebec, the French left an unoccupied zone on the eastern edge of the continent. The English, Dutch, and Swedes focused their North American colonization efforts in that gap between the French and Spanish, but only after the military power of Spain was diminished by the failure of its sleet (the Spanish Armada) to conquer England in 1588. The Caribbean islands and Mexico/Peru became Spain's primary targets for exploitation, after the discovery of accumulated wealth that could be looted and large populations that could be exploited. The Spanish were aggressive in protecting their claims to the New World, but did not have the resources to colonize the entire North American coastline. Lack of available soldiers prevented Spain from challenging all the European competitors occupying "northern Florida," and even Caribbean islands were left with few Spanish settlers. Spanish occupiers came to America immediately after completing their 700-year reconquest of the Iberian Peninsula. The extension of the reconquista to North Africa was blocked when local tribes in Morocco were able to defend their territories and culture, including the Muslim faith. The Portuguese, led by Prince Henry the Navigator, were the first Iberians to explore far offshore. 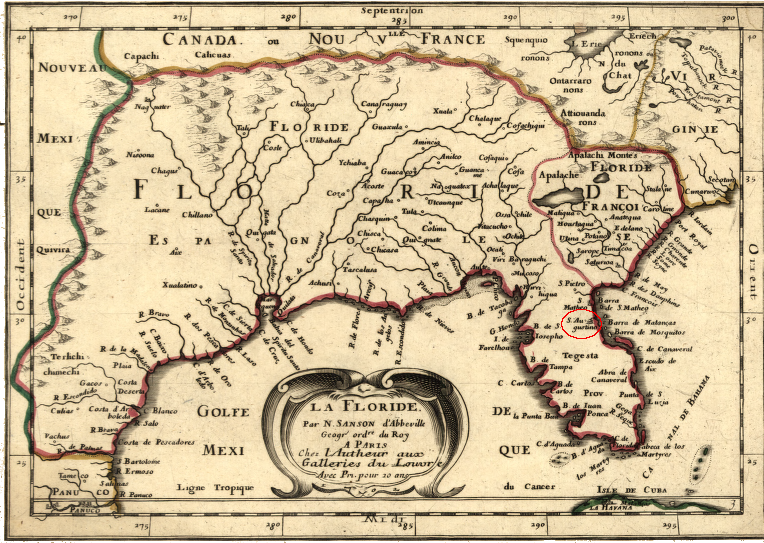 They conquered Ceuta and set up forts on the West African coast, seeking a path to the Spice Islands. 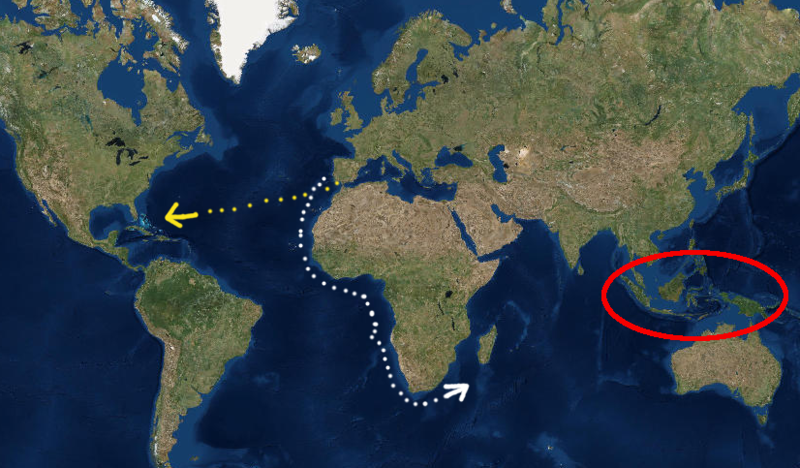 After rounding the tip of Africa, trade with India and Asia occupied the Portuguese. They were the first European nation to bypass the land routes controlled by Muslims, by going around the Cape of Good Hope to open shipping routes to the Spice Islands. The Portuguese lacked the population and military capacity to occupy the territories they "discovered" in Africa. They also found the trade in gold and slaves from Africa, and spices from East Asia, so rewarding that journeys across the Atlantic Ocean were a low priority. Brazil was not settled in the mid-1500's. The Portuguese success in Africa caused the Spanish to look west for a path to the Spice Islands. The Spanish did establish tiny enclaves in North Africa such as Melilla, but soon redirected their expansion towards North America. It was easier to seek wealth and power in the New World than to fight the Berbers in North Africa. Spanish monarchs Ferdinand and Isabella supported Columbus's initial journey west, opening a new route across the Atlantic Ocean, because towards the east the Muslims already controlled the land route and the Portuguese already controlled the sea route. Hiring an Italian to sail west into the unknown offered the best opportunity for Spain to get access to the spices, without paying high costs to deal with rivals. The Spanish did not limit their explorations o the Caribbean. They created detailed maps on the southern part of the East Coast starting in 1514, as slavehunters stole Native Americans to replace the declining native populations on Hispaniola (modern-day Haiti/Santo Domingo). Ponce de Leon made the first attempt to create a permanent colony in North America after Columbus's discovery, eight years after he led the first major European exploration of the North American continent into Florida in 1513. He returned in 1521 with 200 people to start a settlement near modern-day Tampa. On that 1521 trip, Ponce de Leon brought seeds to plant and livestock (cattle, pigs, horses, sheep, and goats) to support the 200+ Spanish colonists. The local Calusa tribe successfully resisted his attempt to occupy their territory. Ponce de Leon abandoned the 1521 colonization project and returned to Cuba, where he died from an arrow wound suffered in Florida. The Spanish chose to focus their investment in the Caribbean, Central America, and South America, but they did explore all of the North American shoreline. After various ships mapped the edge of the continent from the Caribbean to Newfoundland, Spain sent expeditions that explored inland from the Florida and Carolina coast to the Mississippi River and Mexico. 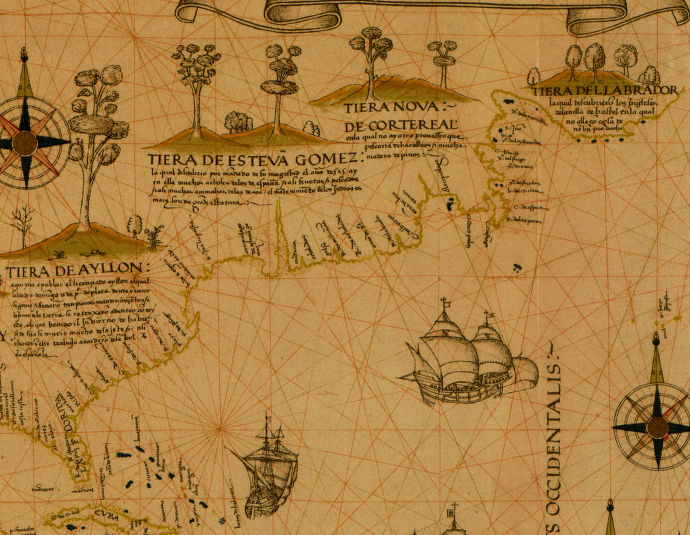 Estevao Gomes, a Portuguese pilot working for the Spanish, mapped the New England coastline in 1524. He named Cape Cod "Cabo de las Arenas" and brought Native Americans back to Spain as slaves in 1525. 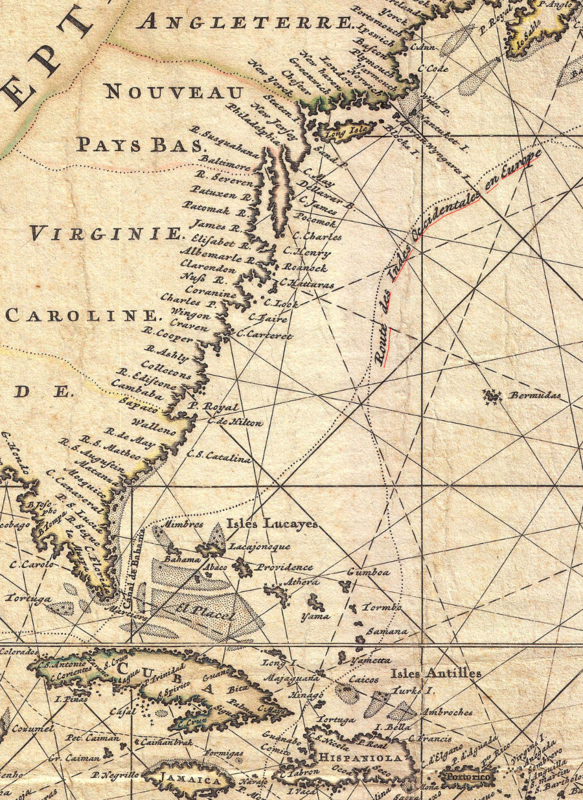 That same year, Captain Pedro de Quejo mapped the coastline from Florida to Delaware, sailing along the Virginia shore on that trip but capturing no slaves. One Spanish slavehunter was Lucas Vasquez de Ayllón. He took a South Carolina native later named Francisco de Chicora back to Spain in 1521, and Chicora spun tall tales about mineral wealth in the New World and succeeded in getting a trip back home. Ayllon's first attempt at settlement involved a six-ship expedition with 600 people. 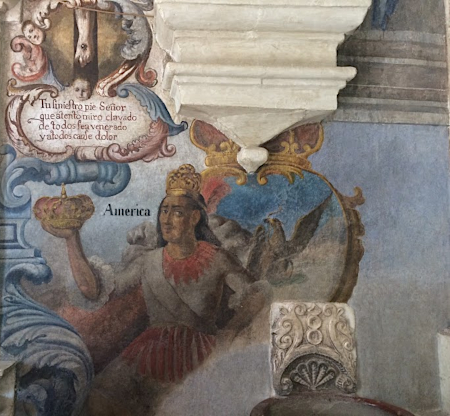 It left from Hispaniola in 1526, including his captive Native American. 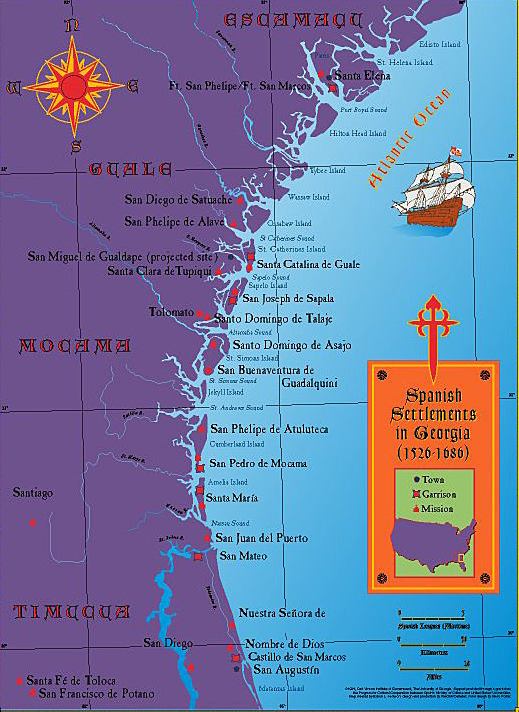 They landed at Winyah Bay near the South Santee River, then moved south to Sapelo Sound (in modern Georgia south of Savannah) and founded a settlement called San Miguel de Guadelupe. Ayllón had invested his personal fortune, but the settlers did not choose their final site until October. It was too late to plant crops, and the local inhabitants were not friendly. The 600 colonists got sick and hungry, and then Ayllón died. After just three months, the survivors returned to Hispanola and San Miguel de Guadelupe was a failure. Ayllón's 1526 colony, in what today is Georgia, was the second attempt by any European nation to create a permanent settlement in North America after Ponce de Leon's failure near what today is Tampa. The next major expedition to North America was also led by a Spaniard seeking to become richer from new discoveries. In 1528, Pánfilo de Narváez took 300 soldiers on his expedition through Florida. They landed at the site of modern Tampa and spent the winter at Apalachee (modern Tallahassee), before traveling west along the Gulf Coast. The next Spanish investment in exploring North America was Hernando de Soto's party between 1539 to 1543. It traveled inland from Tampa. Finding Juan Ortiz, a survivor of Narvaez expedition, provided de Soto a translator and guide. Hernando de Soto's group went much deeper into the interior of today's southeastern United States, and came close to the modern-day boundaries of Virginia. In 1540, his explorers camped at the Native American town of Xuala near what is now the town of Morganton, North Carolina. The impact of the Spanish as they travelled through Native American communities must have been dramatic. Local leaders and their followers were seized and forced to obey de Soto's commands, including serving as guides and bearers of Spanish supplies. The Spanish had swords, armor, guns, horses, large mastif dogs trained to maim people, and sufficient military capacity to go wherever they desired. Those who had been leaders lost status, since they clearly lacked the power to protect their followers. After the Spanish moved on to dominate another Native American community, those left behind who had survived the visit must have struggled to rebuild their society. After the disruption of de Soto, old assumptions of authority and obligation may have been replaced by new alliances and allegiances. The political and religious patterns discovered by later English colonists may have been created over just the last three generations. The Native American cultures disrupted by the English fur traders and settlers during the 1600's and 1700's may have existed since the mid-1500's. The mountains were first explored by Europeans when a Spanish expedition under Hernando de Soto arrived in 1540. He reported the area to be pleasant and spent a month resting his horses and enjoying the hospitality of the natives. 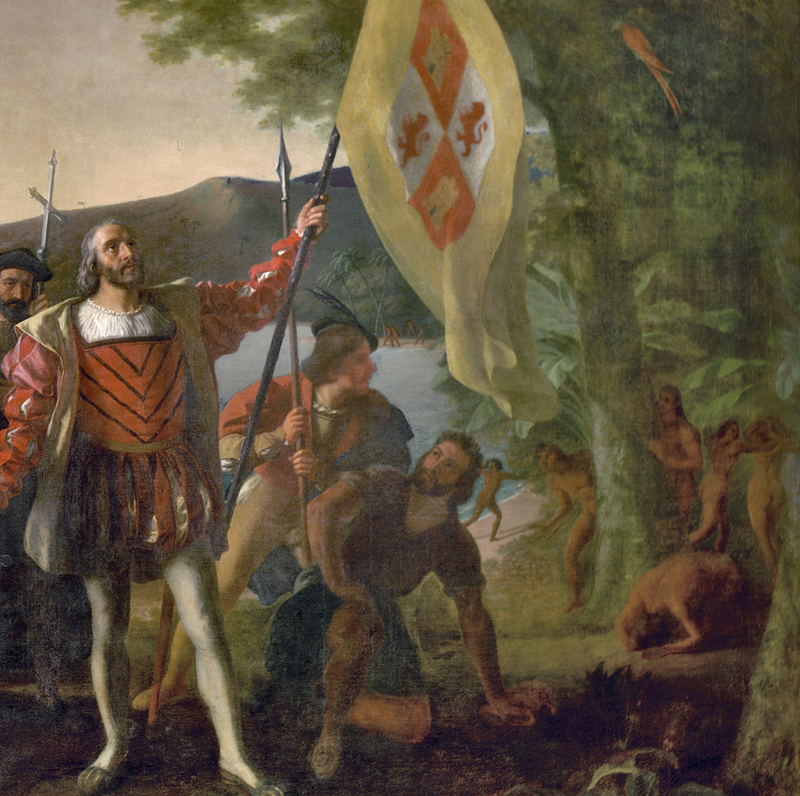 Hernando de Soto's expedition brought Spanish goods into Native American communities, and some items must have been traded through the Piedmont into Virginia. The soldiers probably brought diseases as well, such as influenza and malaria. Those diseases can spread to other people, but would not trigger pandemics that would depopulate the region. The damage done by those diseases would have been limited to just a small number of Native Americans living near the path of the exploration party. The Spanish men who made it to Xuala had already lived though the stage of smallpox when they could have infected others, and de Soto's expedition may not have brought pandemic-causing diseases. The soldiers were adults who had survived the killer infections, and could no longer transmit them. Much later, English colonists in the Carolinas set up a slave trade to capture Native Americans. If the Spanish had not already brought depopulating diseases, the English did. Pandemics during the English colonization period killed most of the people within Native American towns. Spain dominated exploration of North America for a century. For the first six decades of the 1500's, France, England, and the Netherlands lacked the capacity to create colonies in the New World. The pressure for Spain to occupy North America was minimal. The Spaniards focused on pillaging the native tribes in Mexico and South America of their gold and silver, sending shiploads of looted wealth back across the Atlantic Ocean. Portugal chose to focus on Brazil and the African slave trade, after dividing its claims to the New World with Spain under the Treaty of Tordesillas in 1494. However, European rivals were able to capture Spanish ships carrying New World wealth back home even when the nations were not officially at war. To support the intercept-the-Spanish-treasure-fleet efforts, those European nations did consider establishing bases in North America. The Spanish recognized the need to establish their own North American bases to protect Spanish ships, and to block European rivals from establishing privateering/pirate bases on the Atlantic Ocean coastline. The Spanish recognized the threat, but did not have a large enough population in the Western Hemisphere to plant settlements everywhere. The priority locations for Spanish occupation were the Caribbean islands, South America, and Mexico. 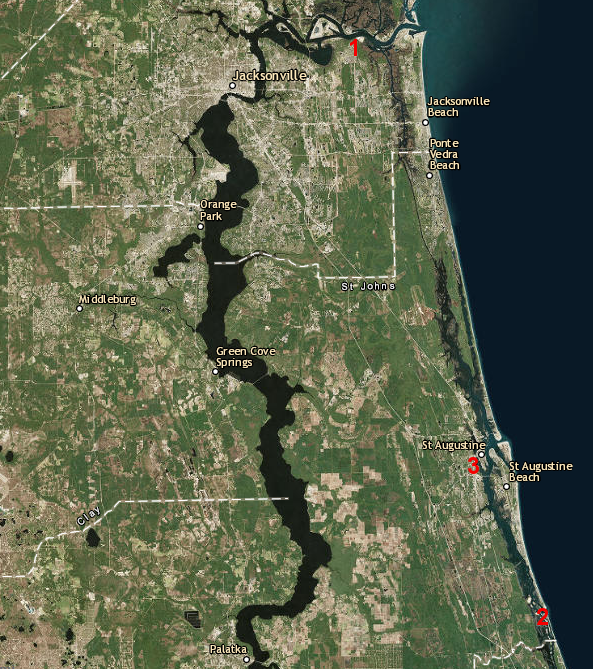 Expanding to the north and planting settlements in "Florida" was a low priority. The Spanish did see a need to establish a foothold on the North American continent, in the province they called Florida. Some sort of base would enhance the legitimacy of the Spanish legal claims, pre-empting other European nations from asserting that they had discovered and occupied vacant land with no Christian presence. A base on the Atlantic Ocean might also help rescue shipwrecked Spanish sailors who might manage to reach the mainland and then get Native Americans to bring them to a known Spanish outpost. In 1557, Spanish King Philip II ordered his viceroy in Mexico to build a Gulf of Mexico base, then carve an overland path to a base on the Atlantic Ocean coastline. That base was planned to be near the site of Lucas Vasquez de Ayllon's failed settlement at San Miguel de Guadelupe. Ships from Mexico could bring a steady stream of supplies to the Gulf of Mexico base to get it started. Ships from the Caribbean or even directly from Spain could bring people and food to the Atlantic Coast base. 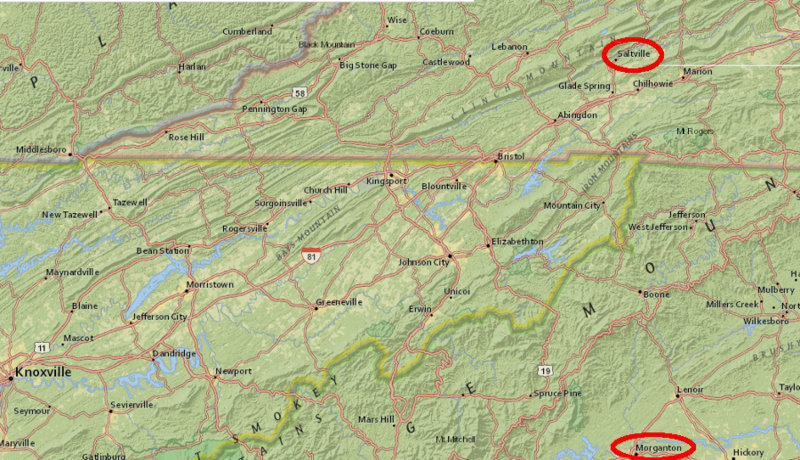 At some point, the two bases could be self-sufficient. An overland link would give each of them an alternative way to receive supplies without a dangerous sea voyage between them through the Florida Strait. 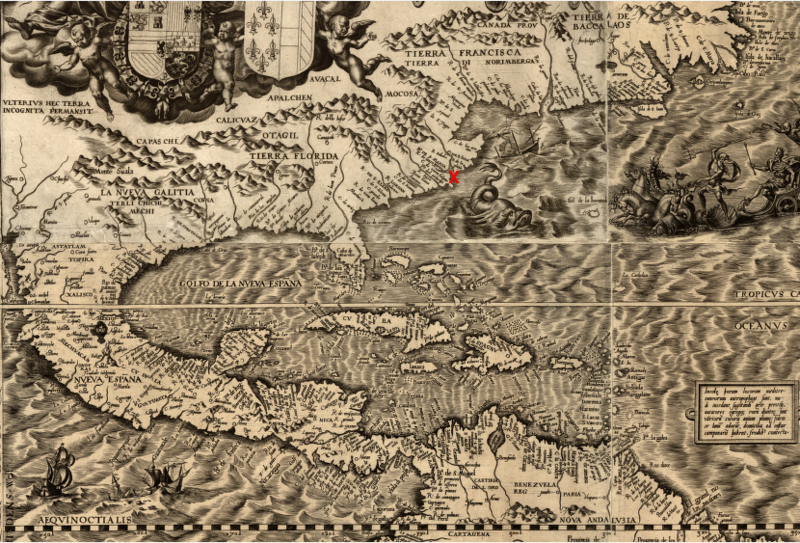 Spanish maps recorded latitude correctly, but they were off the mark for longitude. East-west distances were not calculated with great accuracy until a portable timekeeper was developed by the Englishman John Harrison in the 1760's. In the 1500's and 1600's, Spanish and English officials assumed the North American continent was more narrow than it really was, and that distances from the Atlantic Coast shoreline to the Ohio and Mississippi rivers were shorter than reality. 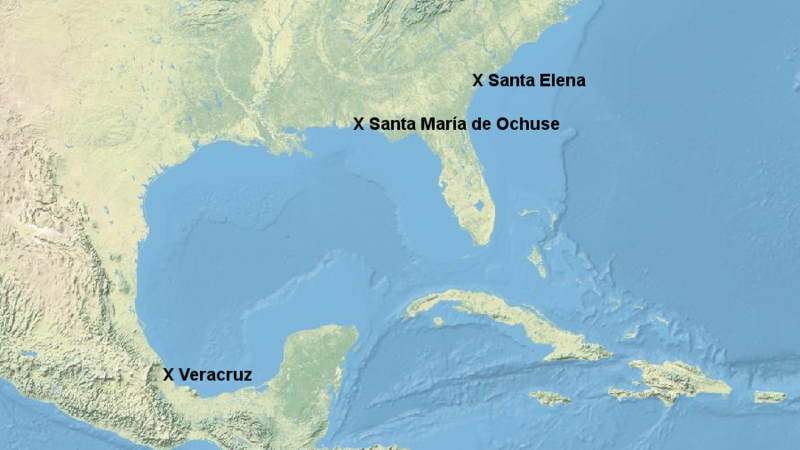 Their basic misunderstanding of longitude led Spanish officials to think they could establish an outpost somewhere on the Gulf of Mexico, send ships from Mexico to that base, and then carry supplies overland to an Atlantic Ocean base at Santa Elena (at modern Parris Island in South Carolina). 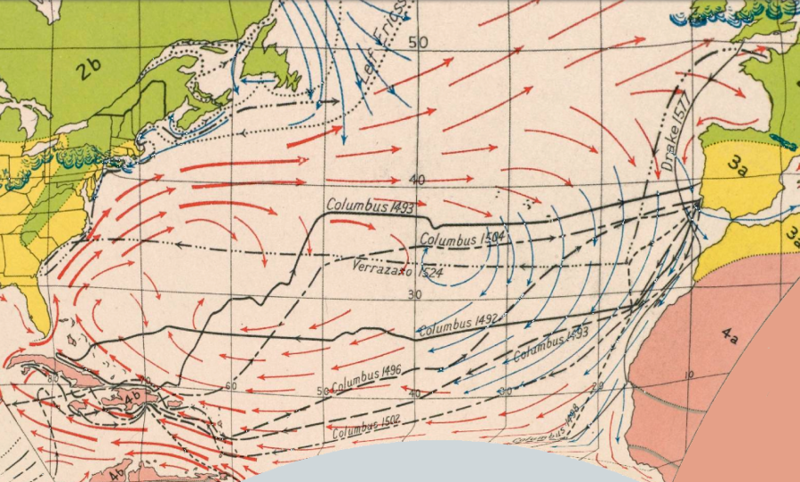 Supplying an Atlantic Ocean colony via overland caravans from a Gulf Coast colony was expected to be easier than sailing from Mexico through the dangerous straights around Florida. 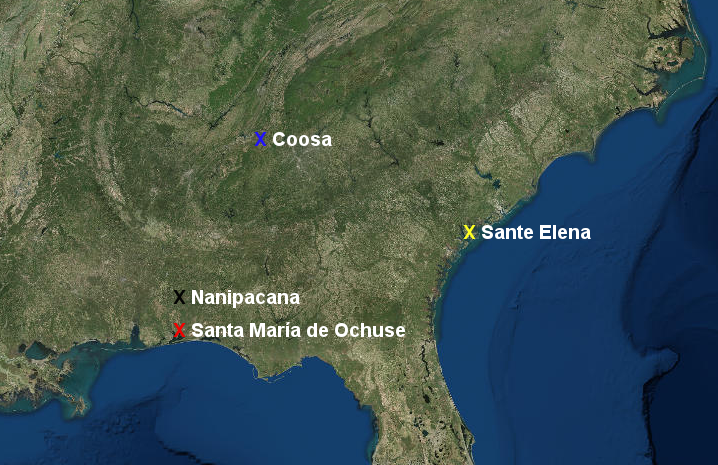 In 1559, the Spanish created the Santa María de Ochuse settlement on the Gulf Coast at what is now Pensacola, Florida. Tristan de Luna sailed from what is now called Veracruz in Mexico, with at least 550 soldiers and 200 Aztecs, to establish a colony at what we now call Pensacola Bay. Soon after landing, a hurricane wiped out most of Tristan de Luna's ships. The Spanish were unable to supply the settlement, despite sending four major maritime relief expeditions. 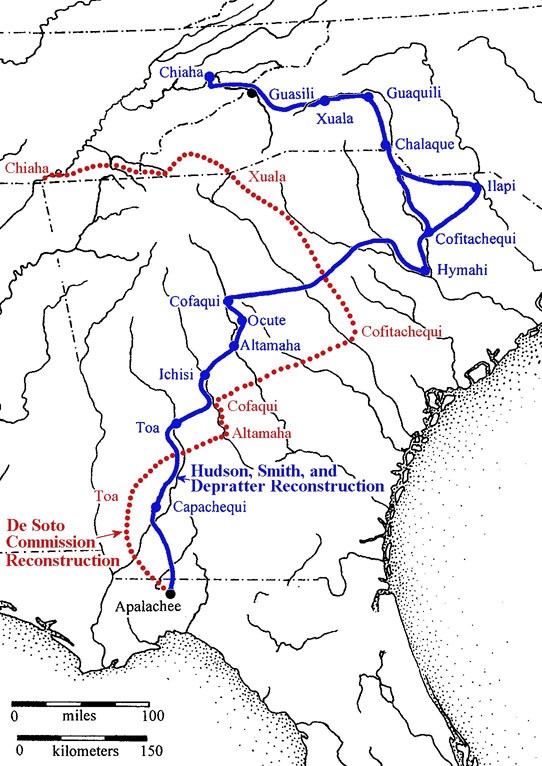 At one point, the remaining colonists moved inland to a Native America town of Nanipacana on the Alabama River, and sent 200 men further north to Coosa at the headwaters of that river to get supplies. The effort was finally abandoned in 1561. Without the supply base on the Gulf of Mexico, the Spanish postponed plans to establish an outpost on the Atlantic Ocean shoreline. The French finally triggered the Spaniards to build fortifications and settle colonists on the Atlantic Ocean coastline. In 1562, Jean Ribault explored the St. John's River. He chose to sail north before constructing Charlesfort at Port Royal, South Carolina, near the modern Marine Corps base at Parris Island. Ribault and most of his men returned to France, leaving behind a token force of 28 men in the fort. They became the first French colonists in North America since 1541. Their numbers were large enough to establish the French claim and protect against hostile Native Americans, but the soldiers must have known there were too few to defend the fort against any determined attack by a Spanish ship. Resupply from France was interrupted by conflict in Europe (a precursor to what would happen to English colonists left on Roanoke Island in 1587, which resulted in the "Lost Colony"). Ribault's French garrison at Charlesfort lacked both food and discipline. After the military commander exiled one soldier, which would have forced him to starve, the other soldiers mutinied. The commander was killed and the exiled soldier was rescued. The soldiers then demonstrated great creativity by building a ship to return to Europe. When it sailed, the French abandoned Charlesfort without ever seeing the Spanish. They arrived later and burned the abandoned fort. In 1564, a new French expedition returned to start a new base. This time, the effort was partly an attempt to create a refuge for Protestant Huguenots fleeing religious persecution in France. The Spaniard who responded was Pedro Menéndez de Avilés. In 1565, he had obtained authority from Spanish King Philip II to govern lands in Spain's "Florida." Menéndez knew from previous explorations by Pánfilo de Narváez and Hernando de Soto that North American tribes had not accumulated storehouses of gold or silver comparable to civilizations in Mexico and Peru, but there was still potential for private profit. An additional incentive for Pedro Menéndez de Avilés was that his son had disappeared in a storm near Bermuda when the treasure fleet was returning in 1561. It was possible the son's ship had struggled back to the mainland and he had survived in a Native American community awaiting rescue. A patent, or asiento, was issued March 20, 1565, by the provisions of which Menendez was required to sail in May with ten vessels, carrying arms and supplies, and five hundred men, one hundred to be capable of cultivating the soil. He was to take provisions to maintain the whole force for a year, and was to conquer and settle Florida within three years; explore and map the coast, transport settlers, a certain number of whom were to be married; maintain twelve members of religious Orders as missionaries, besides four of the Society of Jesus; and to introduce horses, black cattle, sheep, and swine for the two or three distinct settlements he was required to found at his own expense. The King gave only the use of the galleon "San Pelayo" and bestowed upon Menendez the title of Adelantado of Florida, a personal grant of twrenty-five leagues square, with the title of Marquis, and the office of Governor and Captain-General of Florida. After the king received reports of new French settlements in Florida, he increased royal support. Pedro Menéndez de Avilés finally sailed from Cadiz on June 29, 1565 with 19 ships and 1,500 people. Sailing from Spain was a different approach than the one used in 1526 by Lucas Vasquez de Ayllón, who had recruited his 600 colonists and had sailed from Hispaniola to start the colony of San Miguel de Guadelupe back in 1526. 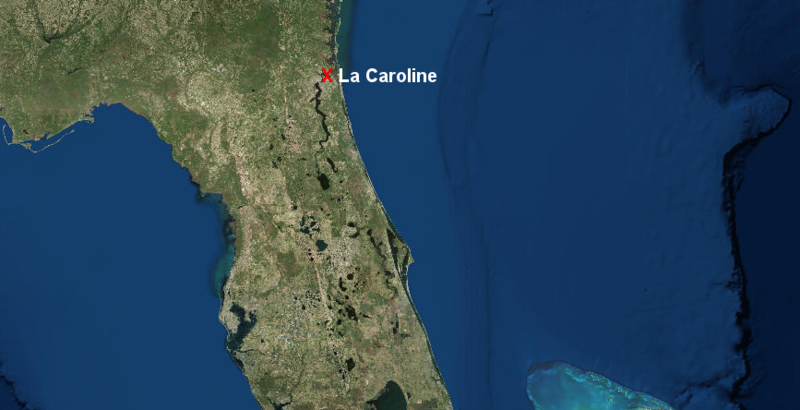 Menéndez arrived just after Ribault brought new supplies and colonists to La Caroline, so the Spanish sailed south and started to build a base on August 28, 1565 (St. Augustine's day). The French sought to strike first at the temporary Spanish camp on the Florida coast, but the Spanish got lucky. Ribault's ships were wrecked by a storm, and the Spanish recognized that La Caroline was not protected by enough soldiers. They quickly attacked and captured La Caroline, converting it into their own Fort San Mateo. Menéndez followed up on the destruction of the French fort on the St. Johns River and the execution of the "trespassing" Huguenots, by constructing the town of St. Augustine in 1565. It is the oldest continuously-occupied European settlement in North America. In 1566, Pedro Menéndez de Avilés moved north after hearing the French were returning to Charlesfort. He built Fort San Salvador and established his second settlement at Santa Elena, at the old French Charlesfort. Today, it is the eighth hole of the Marine Corps golf course on Parris Island. There was not enough food for everyone at the settlement, especially after the unplanned military forces arrived. A new and larger Fort San Felipe was built at Santa Elena. In part to cope with the limited food supply, Juan Pardo took half of the soldiers on an exploration of the interior towards the Spanish settlements in Mexico. It was also a scouting expedition, looking for an overland road route to the silver mines at Zacatecas, Mexico. Longitude was hard to calculate before accurate portable clocks were available, however, and the Spanish miscalculated the distance. They thought the silver mines were 780 miles west of Santa Elena, rather than the actual 1,800 miles. In 1567, the Juan Pardo expedition walked up the Catawba-Wateree River. Unlike de Soto, his expedition had no horses. The Spanish passed by the town of Cofitachequi that de Sota had visited, then Otari at modern-day Charlotte as they crossed the Piedmont to the Blue Ridge. At each town, the Spanish read the requerimiento, asserting their authority over the land and establishing the Catholic faith. Though he did not negotiate the claim of sovereign control, Pardo's approach to the Native Americans was less blunt that de Soto. He traded iron tools for food, and arranged for the Native Americans to build special storehouses with corn to feed the Spanish on a return trip. At the base of the mountains, Pardo established Fort San Juan. He chose the same town where de Soto had camped in 1540. In 1540, the site known to de Sota as "Xuala." In 1567, Pardo called it "Joara." 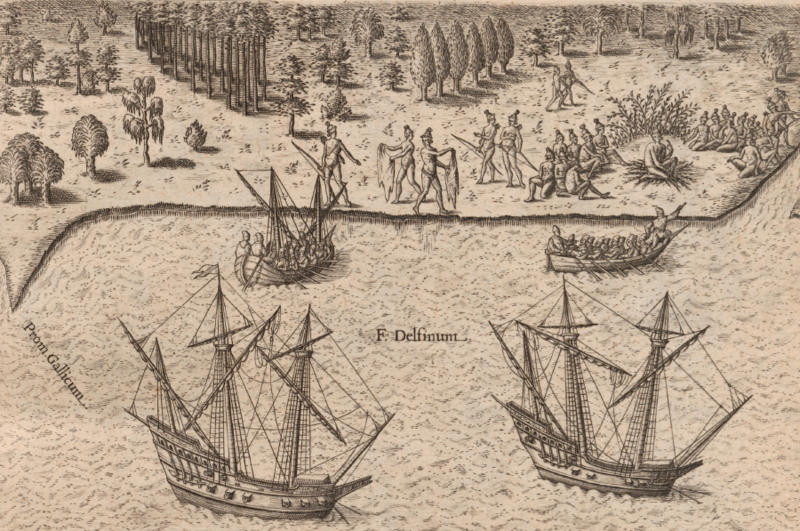 As a result of that expedition to Maniateque, it is possible that the first Europeans to enter Virginia were members of that 1567 expedition led by Hernando Moyano - not counting the occasional sailors seeking water, food, information, slaves, loot, and female companionship on the shoreline. Europeans would not gain a clear understanding of territory that far inland far from the Chesapeake Bay for another 150 years, when explorers such as Dr. Thomas Walker mapped a route through the mountains at Cumberland Gap. The inland forts of the Spanish were all destroyed within a year under pressure from local Native Americans. In 1568, Jesuits established Mission Santa Catalina de Guale on St. Catherine's Island. 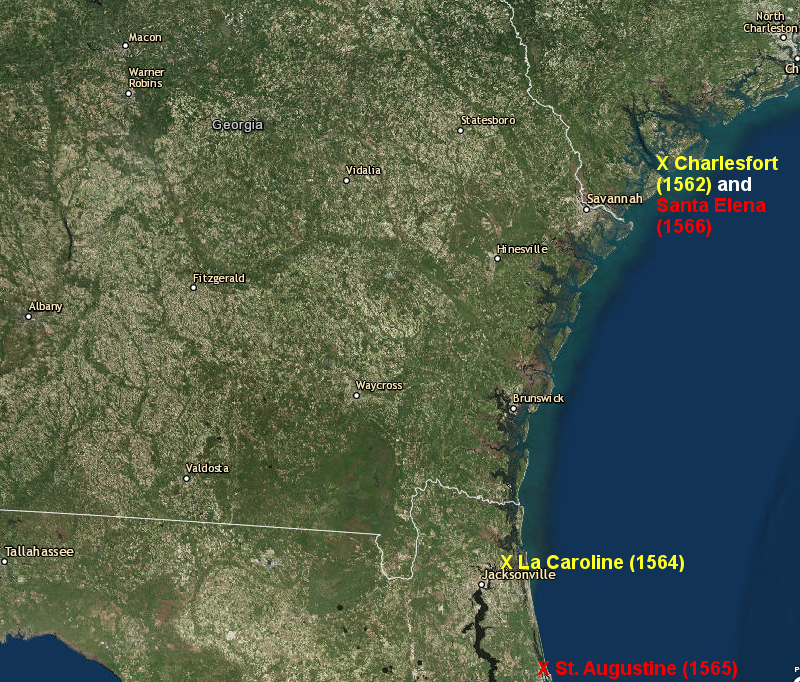 Jesuits also traveled to the Chesapeake Bay and attempted to start the Ajacan settlement on the edge of the York River. The Jesuits in Virginia were killed in 1571, and the other Jesuits in the southeast were replaced by Franciscan friars in the 1570's. The Franciscans were more successful in starting missions in Native Amrican communities, spreading the Catholic faith and Spanish culture. Unlike the Jesuits, they never attempted to start a mission as far north as Ajacan. The Spanish retained control of the seacoast at Santa Elena until 1576. Menéndez died in 1574, and his sons-in-law took control but were unwilling to cooperate in managing the colony. The local Native Americans attacked and, after the Spanish retreated to St. Augustine, destroyed the town of Santa Elena and Fort San Felipe. A new governor of Florida replaced Menéndez's sons-in-law and returned with soldiers in 1577. He built yet another fort there, Fort San Marcos. Sir Francis Drake raided the Spanish settlements in the Caribbean as a privateer in 1586. His last attack was the burning of St. Augustine, after which he sailed to the English colony to Roanoke Island and took nearly all the colonists back to England. Sir Richard Greenville arrived at Roanoke Island soon afterwards and left 15 men to maintain an English possession near the Spanish in Florida. All 15 had disappeared when the next set of colonists (ultimately the "Lost Colony") arrived in 1587. Though the Spanish governors concentrated military forces at St. Augustine, the Catholic missionaries continued their efforts to convert the local Native Americans. After more friars arrived in 1587, the Franciscans opened a mission on Cumberland Island in the capital town of the Timucua-speaking Mocama. The Native American population was dramatically reduced by disease, by the demands for work and food, and by cultural disruption. The Guale finally rebelled in 1597, and the Spanish abandoned the missions north of St. Augustine until 1604. The inland missions, where supply from Spanish ships was not possible, were the hardest to maintain. After Charles Town was settled in 1760, English traders began to connect with various Native American groups on the coast and inland. The Yamasee in particular cooperated with the English, after being forced north by the Guale. The English promoted raids to capture slaves from the Guale and others associated with Spanish missions, and sent the Native American captives to Caribbean islands. Spanish reluctance to block English encroachment stands in contract to French assertiveness 50 years later and further north. The French moved south from the St. Lawrence River valley, while the English expanded westward into the Ohio River backcountry. That rivalry also involved multiple Native American groups, and led to open warfare between France and England. The French and Indian War in North America then expanded to become the Seven Years War in Europe, finally concluding in 1763. In that conflict, France ended up losing all of its territory in mainland North America, key sugar-producing islands in the Caribbean, and some authority in India. Spain's caution did not produce a better result. In the end, like France, Spain was forced to cede its land claims in North America to the English and ultimately to the American settlers. Spain's opportunity to stop the English from occupying the East Coast, within the boundaries of "Florida," faded in the 1600's. After the failure of the Spanish Armada in 1588, England's economic and military capacity increased as Spain's decreased. The colony of Georgia was chartered in 1733. Colonists built Fort Frederica in 1736, extending England's claims further south. The War of Jenkins' Ear started in 1739, and was a precursor to the War of the Austrian Succession in Europe. During that conflict, there was direct fighting between Spanish and colonial forces in North America. 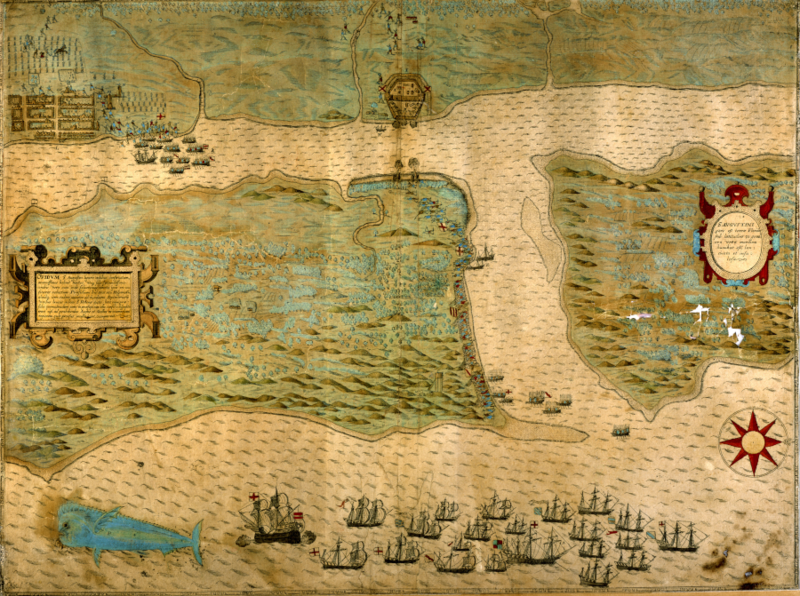 The Georgia militia attacked St. Augustine in 1740, but failed to capture it when Spanish supply ships avoided the Royal Navy blockade. Spanish officials then launched an invasion into Georgia in 1742. They were defeated near St. Simon's Island, at site since named Bloody Marsh, and never got near Savannah. Until 1763, Spanish and colonial aggression was conducted mostly through proxies, as each side recruited Native American allies to attack the other. 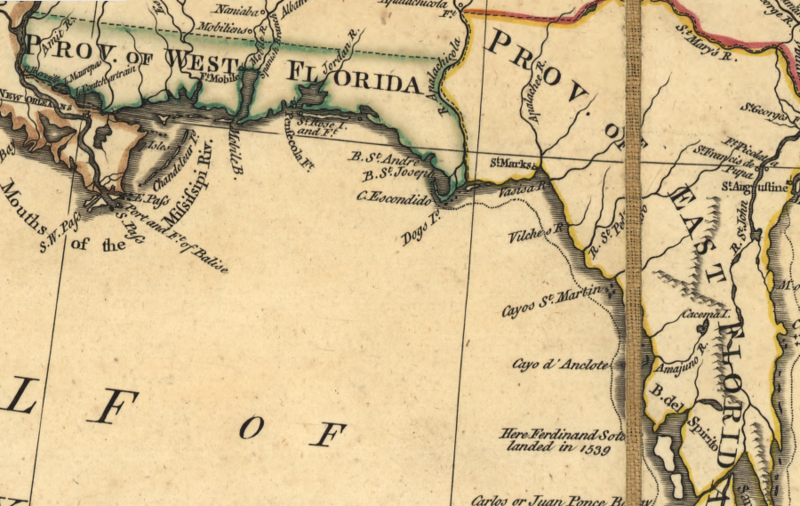 In 1784, Great Britain returned Florida to Spain, after losing the war with American rebels. Spain had allied with the United States in the American Revolution, and the new nation wanted militarily-weak Spain to control the land on its southern frontier. Militarily, Great Britain was more powerful; politically, Great Britain was a greater threat. At the end of the American Revolution, the United States was a greater threat to Spain than Spain was to the United States. 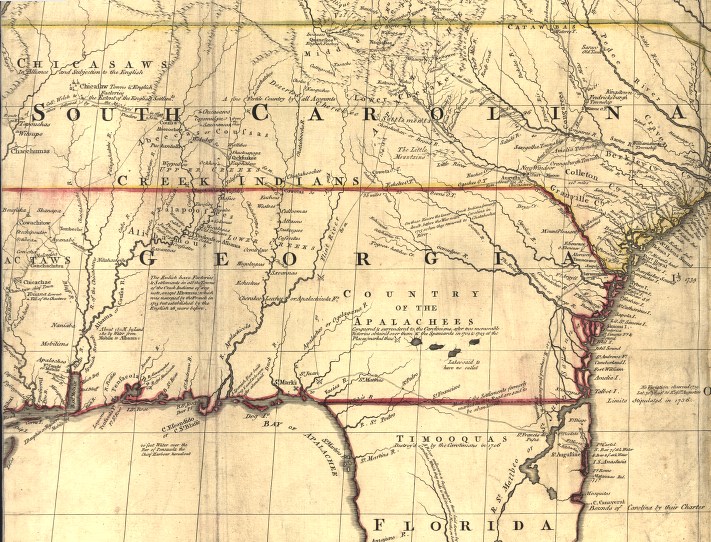 Leaders throughout the newly-independent country expected settlements to expand southward, and eventually the country would obtain control of Florida. Many had the same expectation of the Spanish lands west of the Mississippi River. France had transferred control over Louisiana to Spain in 1762, compensating it for losses in the French and Indian War. Napoleon reclaimed and sold the territory to Thomas Jefferson's negotiators in 1803. The boundaries of the territory were not clear, including where the French control ended east of New Orleans and Spanish Florida began. 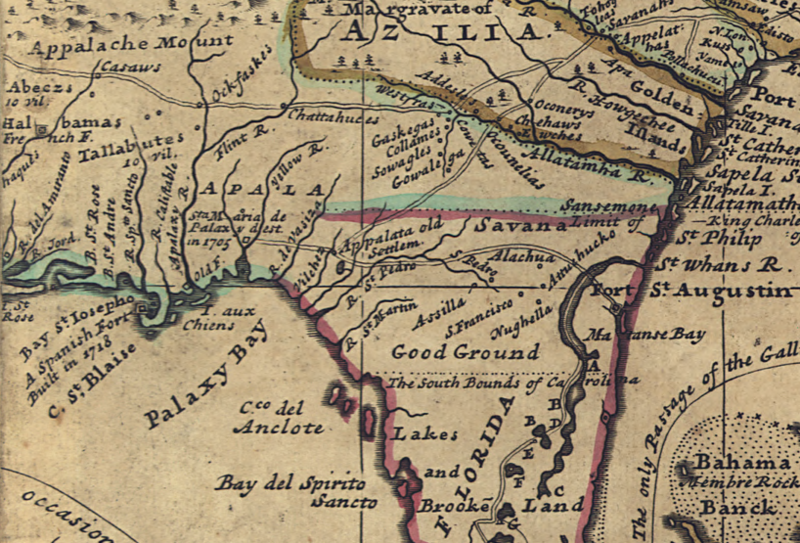 The Americans claimed West Florida was included as part of the Louisiana Purchase. Since 1784, Spain had relied upon the Creeks and other Native American allies to contest the gradual occupation of that land by American settlers. Andrew Jackson invaded Spanish-controlled East Florida in the First Seminole War. He captured Pensacola in 1818, but was directed to withdraw so a political resolution could be negotiated with Spain. 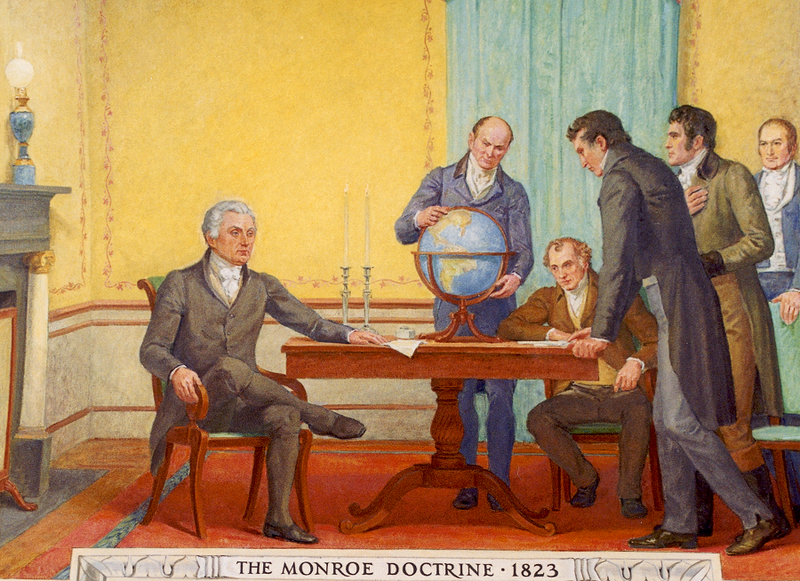 The Adams-Onis treaty, signed in 1819 and ratified in 1821, ended Spain's long efforts to control land on the East Coast of the United States in return for American recognition of Spanish claims to Texas.